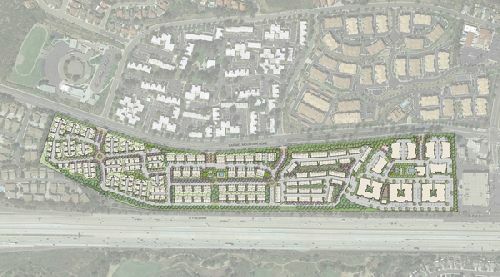 Lennar Corporation has acquired a 41.5-acre property in San Diego, California for the proposed development of a new 601-home residential community known as Pacific Village. The property is situated in Rancho Penasquitos, a suburban neighborhood at the southern end of North County. Located off of Carmel Mountain Road, at the northwest corner of the 56 Fwy and I-15, Pacific Village will feature a total of 601 new homes for middle class families. The community will be composed of 99 single-family homes, 105 triplex homes, 120 townhomes, and 277 apartments. Pacific Village will provide neighborhood benefits including $10 mil for community improvements and infrastructure, improved sidewalks, landscaping and a bike lane along Carmel Mountain Rd, new traffic signals along Carmel Mountain Drive, and a sound wall along Interstate 15. The community will incorporate sustainable design and energy-saving elements, including solar powered homes, home automation, accommodations for electric vehicle charging stations, and water-smart design. Pacific Village is a partnership between Lennar Homes and Atlantic Pacific Companies, two respected names in housing with long track records for delivering high-quality communities. The multi-phase development is anticipated for completion in 2020. The seller was Atlantic Pacific Companies. Cushman & Wakefield’s Kevin Nolen, Tim Winslow and Jason Kimmel, who specialize in land and multifamily property in San Diego, represented Lennar in the deal.